RVs and motorhomes become a second home. These vehicles are a combination of a vehicle and a home. They have windows, skylights, and doors that can open up to the outside whether driving or stationary. Bugs and insects become a problem. 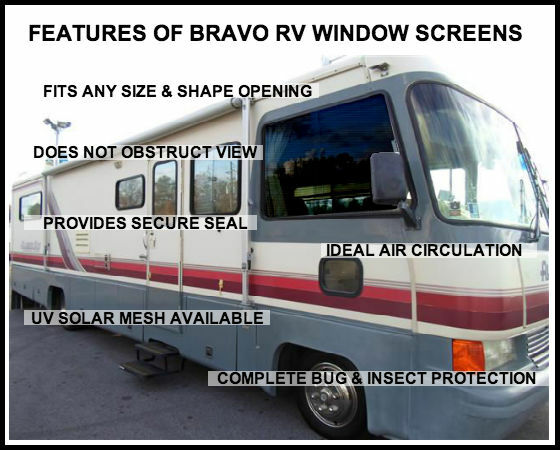 At Bravo, we manufacture flexible RV windowscreens or van window screens that will fit perfectly to those or any opening that you have in your RV or motorhome. They are attach with Velcro ™ fasteners, so you can be sure that they are secure and will not come off, until you are ready to have them come down. The nice thing with Bravo Flexa-products is that they are not a permanent alteration of your vehicle, so when it comes to selling, you will not have to worry that you have unalterable changed your RV or motorhome. 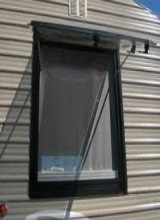 Our products allow the fresh air to circulate through, while still providing you complete insect protection. We also have different mesh options to choose from. Solar coated mesh fabric is a great choice because it protects you from the damaging UV rays, also cuts down on the sun's glare and heat. Solar mesh will help to keep the inside of your vehicle cooler and more comfortable to drive in or park and relax. Bravo products are custom manufactured according to your measurement, so they will fit perfectly to your window, door or skylight. We use only the highest quality products and superb craftsmanship which guarantees you receive the finest products to meet your needs. © Copyright 2019. Flexascreens Canada.